Just a short tidbit of information that has come across into my brain while I have been browsing and watching some of the past CCHL games that I’ve missed due to being a little under the weather lately. To say that the Hawkesbury Hawks have hit a slump is not something that should be taken lightly. The team is only 10 games into the 2013-2014 campaign and they currently sit at the bottom of the Robinson division with a record of 1-8-1. Needless to say head coach Shawn Anderson is not a happy man. The players on the ice have not been competing at top potential and clearly it shows. The coaches know it, the fans know it and most importantly, the whole league seems to know it. There needs to be a shake up in the locker room for them to get back on track. I sense this coming. There’s been too many games that have fallen into losses with a high deficit. Players like Yannik Laliberte and Zach Car needs to step up their games and provide some more scoring. Granted, I know they’re giving it their all but it’s not enough to compete with the competitiveness in teams like that of Carleton Place, Cornwall and Nepean. I can’t harp on the goaltending. Matthew Jenkins and Guillaume Therien are doing everything they can to keep the pucks out of the net. Yes, most games the shots have been close but when you have no defence standing up to help you well, the situation turns bad in a hurry. Somebody needs to light a spark to get things moving in the right direction for the Hawks and FAST. If not, be prepared to be in for a loooong season. Hell, being 1-8-1 into your first 10 games in the season is long enough. 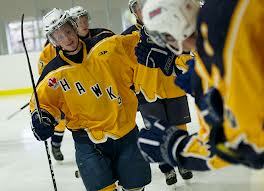 We’ll see how the Hawks take flight when they face the first place Carleton Place Canadiens on Friday night at home. Side note: Do something with that gold jersey. Get a big bad logo on it PLEASE.